Schöne Poipu Beach House von Brenneckes Beach! Nur einen kurzen Spaziergang entfernt, mit Brenneckes Beach und Poipu Beach, ist dieses Strandhaus mit drei Schlafzimmern und drei Bädern am sonnigen Südufer von Kauai der ideale Ort, um die wunderschöne Garteninsel zu besuchen. Genießen Sie die tropische Umgebung, das Meer und den Sonnenuntergang sowie ein helles und luftiges Ferienhaus im Inselstil von Poipu, das sich in einem charmanten Strandviertel befindet. This was a great place to stay for a number of reasons. First, the owners Mark and Nancy were wonderful. We inquired before we arrived about an item for our little grandson and although the house didn't have it, they made sure it was there for us anyway. They provided a basket of fresh fruit, so delicious! Next, the house and location were amazing. The house was spotless, there was a beautiful view from the balcony, and the very short walk to the beach was a joy. We really did see sea turtles on the beach every day and saw monk seals on the beach 4 of the 9 days we were there. Pure paradise! We'll be back! We loved our stay here, great beds with pillows that were really comfie. The house was supplied with tons of extra supplies from fully stocked beach gear to toiletries. Half a block to ocean, close to Brennecke’s beach and turtle watching spots. Hosts were super accommodating, letting us check in early and check out late. Spent a week here and really enjoyed this house. Very well equipped with all kitchen items including spices, beach chairs and umbrella, boogie boards, barbecue and washer and dryer. Only a block and a half from the beach and a small ocean view from the lanai. Great layout with 3 bedrooms and 3 bathrooms, would definitely rent again. I’ve been coming to Poipu for 20 years. What a great find this property was! House is stocked with everything you could need. From boogie boards to towels to the incredibly loaded kitchen. Beds were great as was the 6’6” shower! AC to sleep with was a bonus. House however does not get hot. Very nice airflow and green space all around. Loved the outdoor shower and clothesline too. Mark was awesome to work with. We’ll be returning! Rent this house and you will love it! 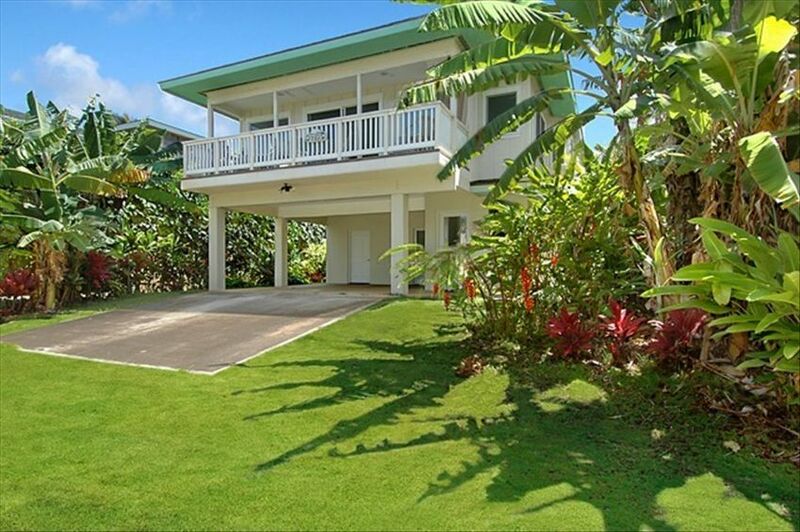 This house is perfectly located in Poipu. Brennecke's Beach for body boarding, snorkeling and swimming is less than a five minute walk. Walk 2-3 more minutes down the beach and you are at Brennecke's Beach Broiler Restaurant and Poipu Beach Park where the snorkeling is excellent. We saw tons of fish snorkeling and even saw a few turtles on the beach and in the water. Mark and Nancy are great hosts to deal with. The house is set up with EVERYTHING you will need. They even have an outdoor shower to clean off the beach sand and salt water at the end of the day. There is a large laundry room downstairs stocked with about six body boards and a few ice chests. They also have beach chairs and umbrellas. About the only thing you will need to bring is a tooth brush, mask, snorkel and fins. We traveled with another family and we really liked that the downstairs is like a separate unit with a bedroom and bathroom. The downstairs also has a living room area with TV and a small kitchen area with counter, microwave, mini fridge, coffee maker, etc. The downstairs unit has a door that can be closed so the occupants are not disturbed when exiting the house from the upstairs. Rent this house and you won't be sorry. These hosts of thought of everything and you will love it! We stayed at this home for a week and it was wonderful. There are three bedrooms that each contain air conditioners which was a must for us. The home was comfortable for our family of six and as an added bonus there were beach chairs, an umbrella and boogie boards already at there so we didn't have to buy or rent any. The location is perfect- within a five minute walk of Brenneke's and Poipou Beaches. Loved it! $250 refundable security deposit required to confirm your reservation. Total charges are due 90 days prior to arrival.